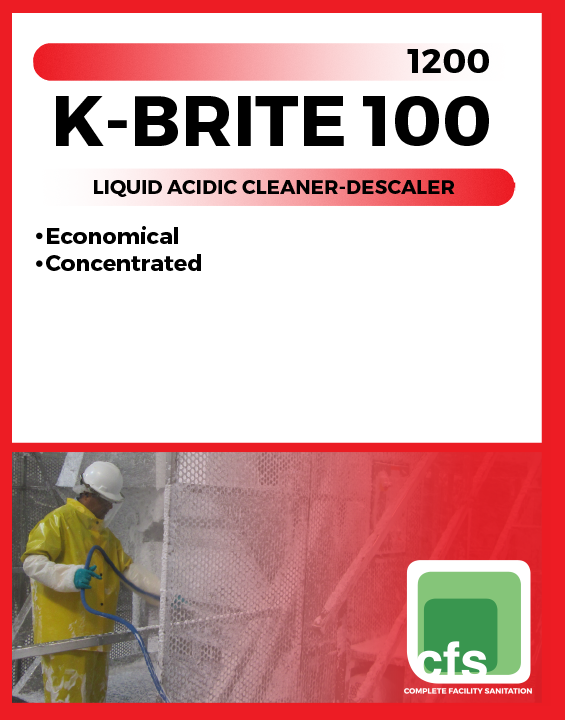 K-Brite 100 is a liquid, high-foaming, acidic cleaner/descaler which is suitable for use in food processing and dairy plants where a heavy-duty, high-foaming acid cleaner is needed. 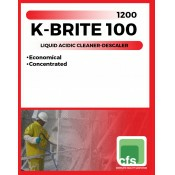 K-Brite 220 is a liquid medium-foaming, acidic cleaner/descaler which is suitable for use in food processing and dairy plants where a heavy-duty, medium-foaming acid cleaner is needed. For manual cleaning or use in mechanical cleaning devices. 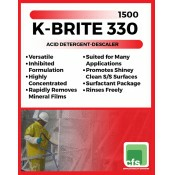 K-Brite 330 is a no foam acidic cleaner and descaler. 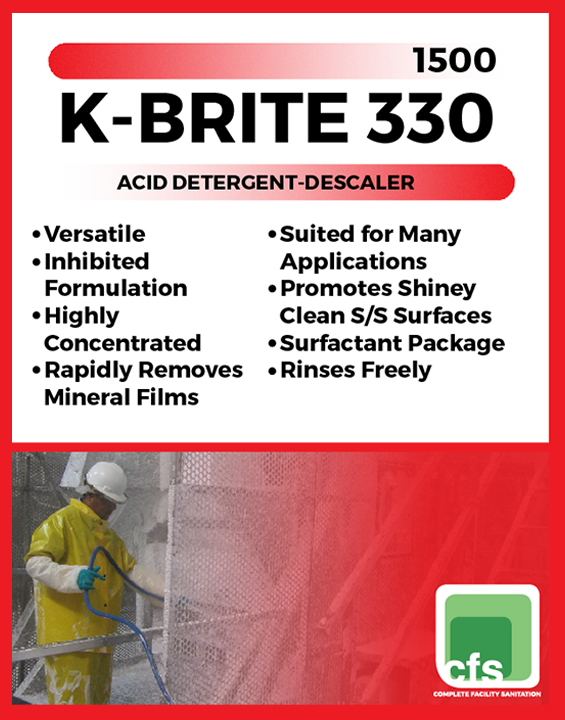 Chemical matters enable K-Brite 330 to work on protein scale and other tough scale deposits. K-Brite 1S is a very highly concentrated and safe low pH liquid containing surfactants, specialty solvents and emulsifiers that gently penetrate and loosen the most difficult soils and oils for quick and complete removal. 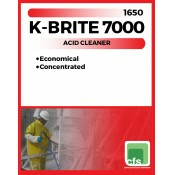 K-Brite 7000 is a concentrated acid cleaner and mineral deposit remover. For extremely stubborn stains, use undiluted. 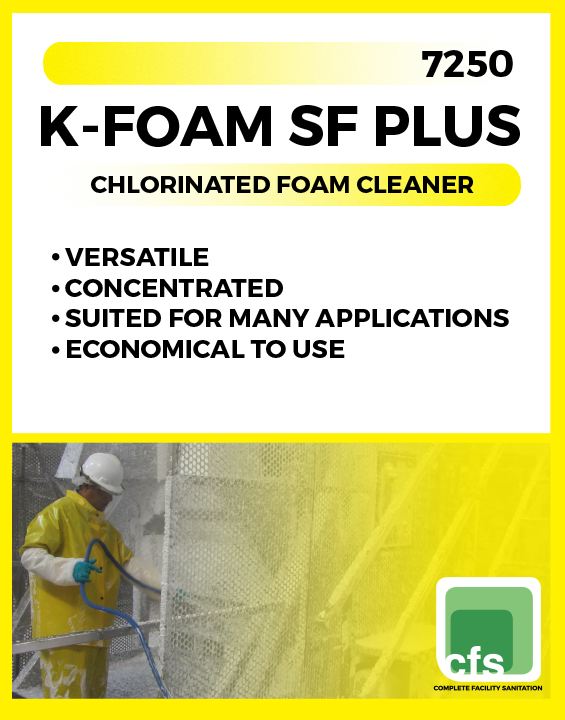 K-Foam SF Plus is an alkaline, chlorinated, self-foaming cleaner for use in meat packing plants, bakeries and other food plants. These characteristics combined in a single package offer economy and convenience advantages. 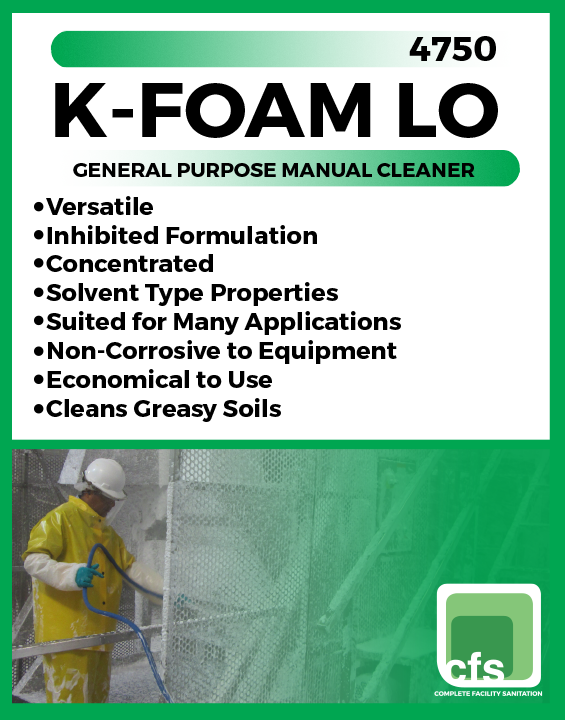 K-Foam SF Plus can be applied mechanically or manually. 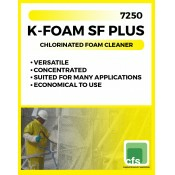 K-Foam SF Plus is safe and mild on steel and stainless steel applications. 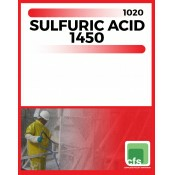 Safe on aluminum and galvanize in recommended dilution. 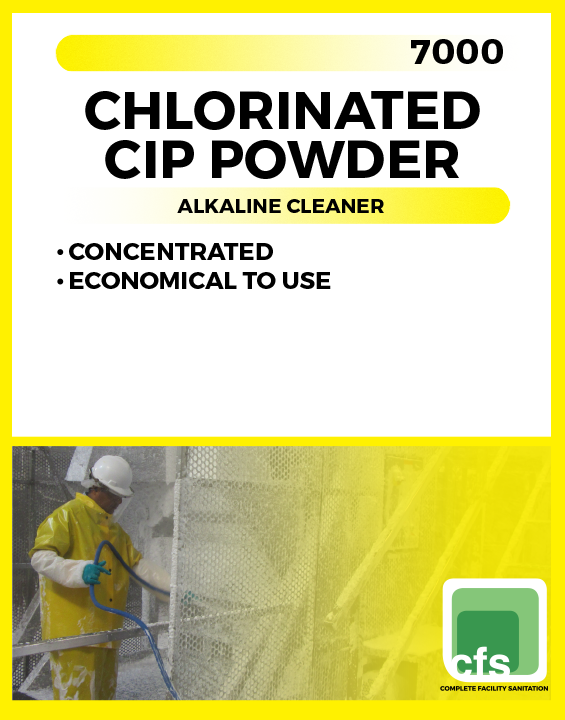 Chlorinated CIP Powder is a formulated heavy-duty chlorinated circulation cleaner of high alkalinity. 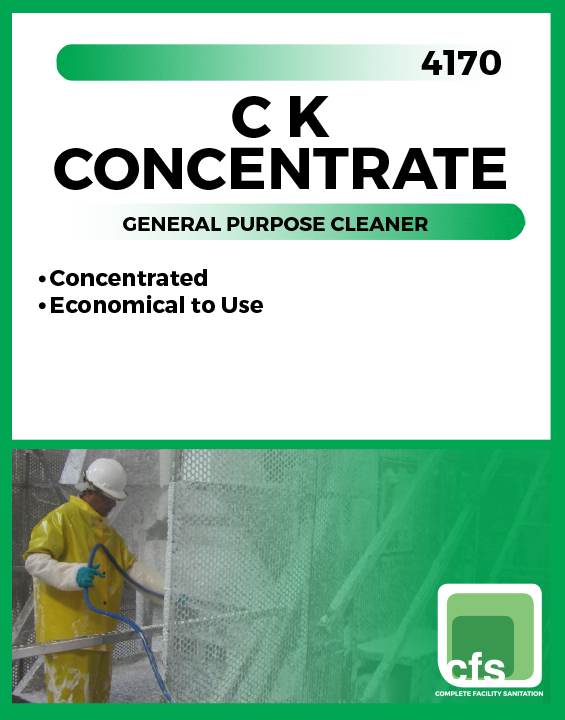 This product is designed to remove heavy-duty soil deposits from cookers, processors, kettles, hot product lines, ham molds and loaf molds. An excellent product for boiling out kettles, pipes and parts. 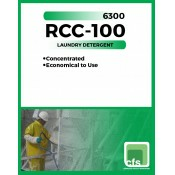 This product, when properly used, will eliminate the need for daily acid usage. 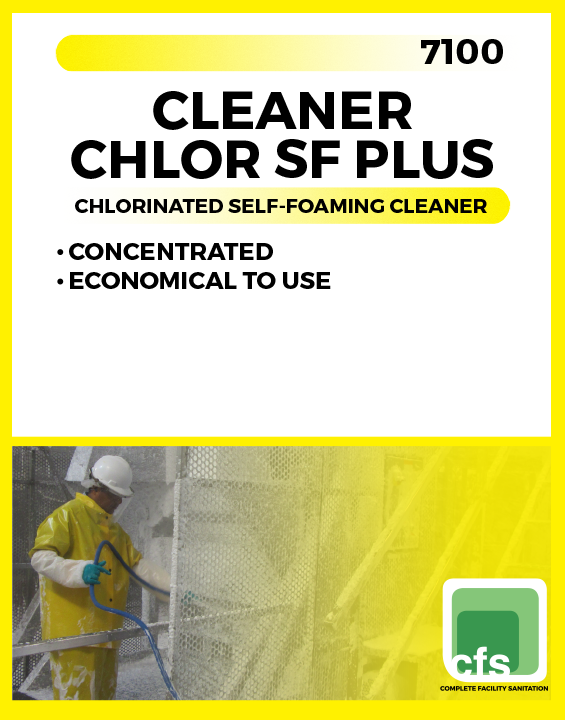 Cleaner Chlor SF Plus is an alkaline, chlorinated, self-foaming cleaner for use in meat packing plants, bakeries and other food plants. These characteristics combined in a single package offer economy and convenience advantages. 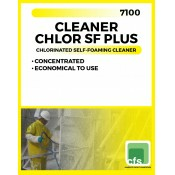 Cleaner Chlor SF Plus can be applied mechanically or manually. 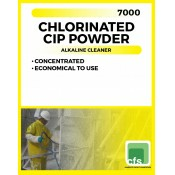 Liqua Klor CIP is a no foaming liquid CIP cleaner containing caustic and chlorine. 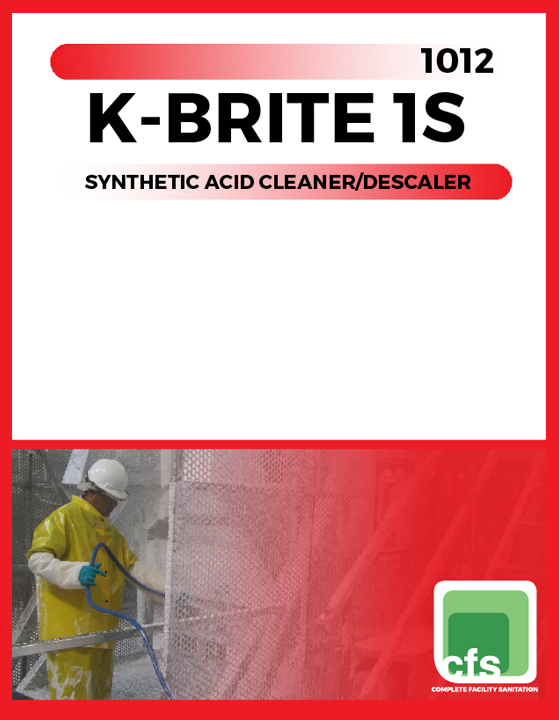 Formulated for the in-place cleaning of dairy and meat processing equipment, it eliminates the need of daily acid cleaning. 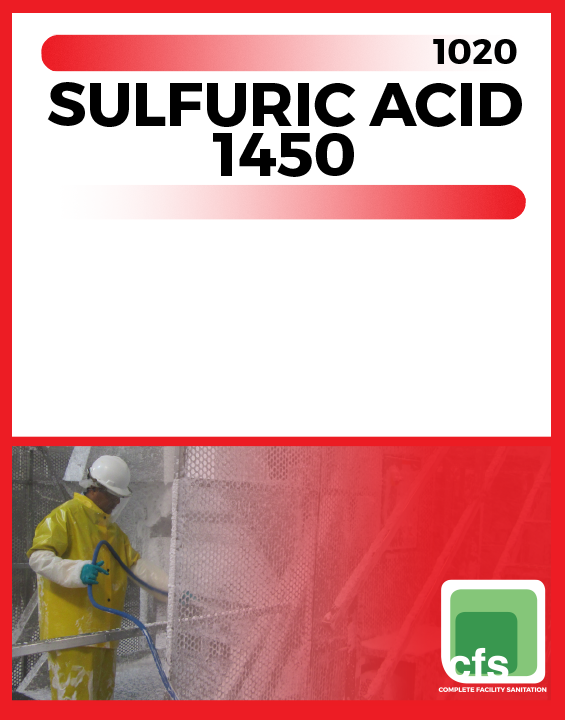 It is acceptable for use in meat and poultry plants. 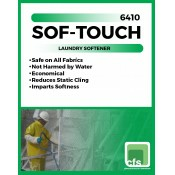 This product is designed for use in liquid feeding systems for proper control and ease of handling. 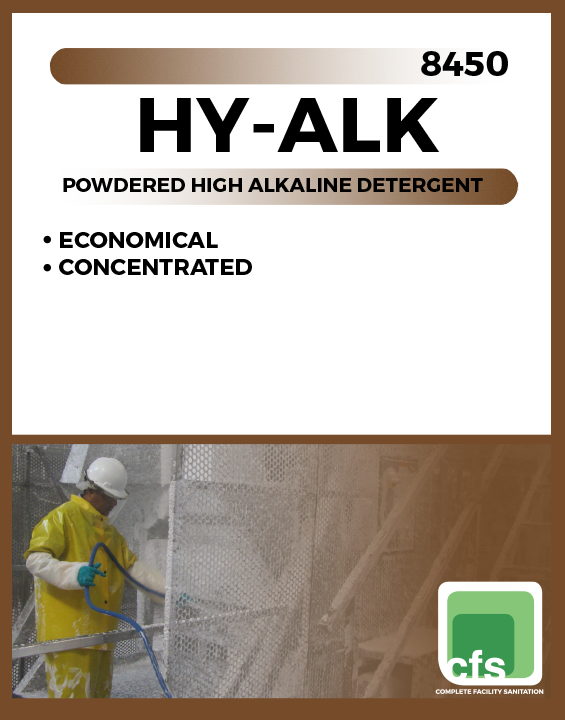 Hy-Alk is a high alkaline type cleaner, specially formulated to clean frying and cooking equipment. 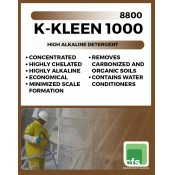 It has a very high level of cleaning ability and gives excellent results in cleaning heavily cooked-on soils. 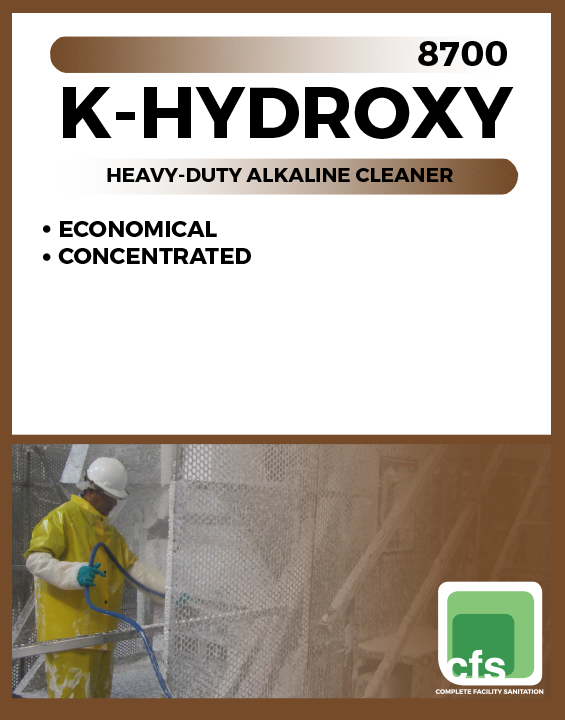 K-Hydroxy is a heavy-duty alkaline cleaner designed to remove burned-on carbon and other baked-on food soils. 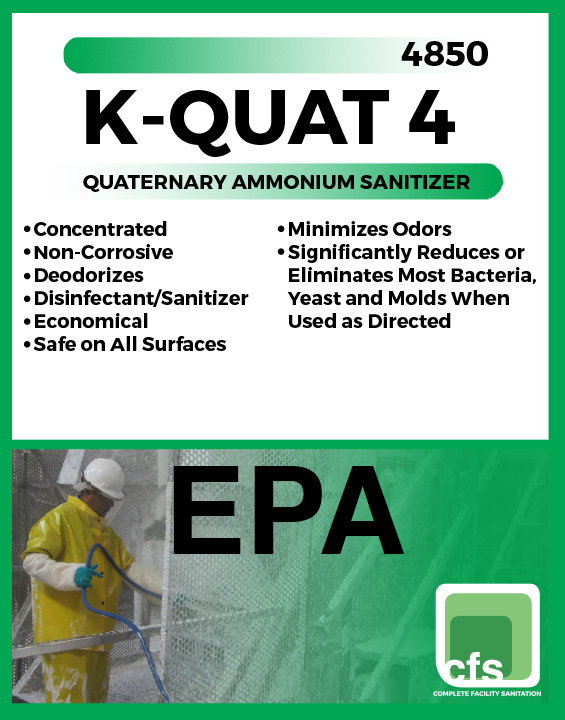 It is effective in removing oils, greased, and proteinaceous deposits commonly found throughout the food industry. 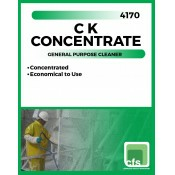 It can be used in central cleaning systems, soaking operations, and immersion tanks. 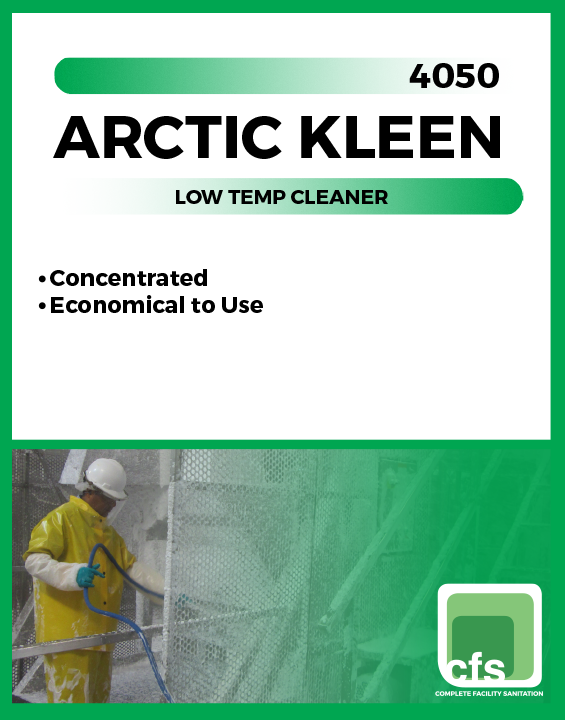 It can be used for boilout with foam and gel and in re-circulating systems of breweries, dairies, bakeries, meat, poultry, canning, and other food plants. 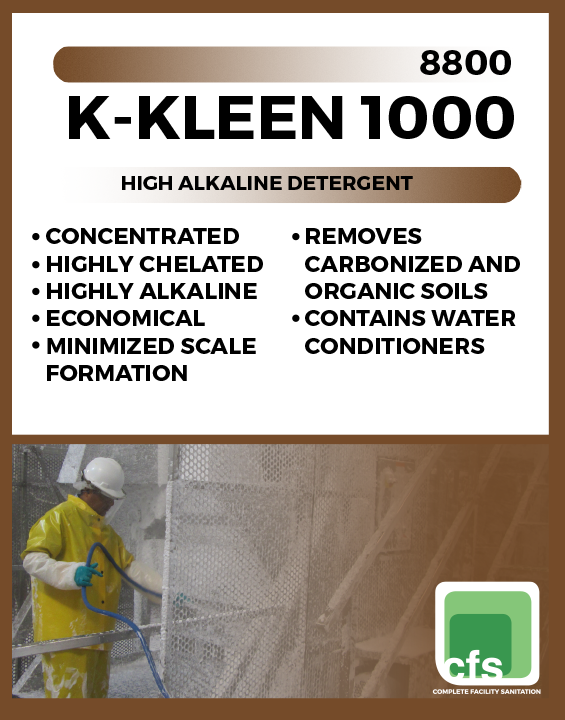 K-Kleen 1000 is a heavy-duty, liquid alkaline detergent specifically formulated for use in cleaning heavily soiled fryers, cookers and processing equipment typically found in food processing plants. 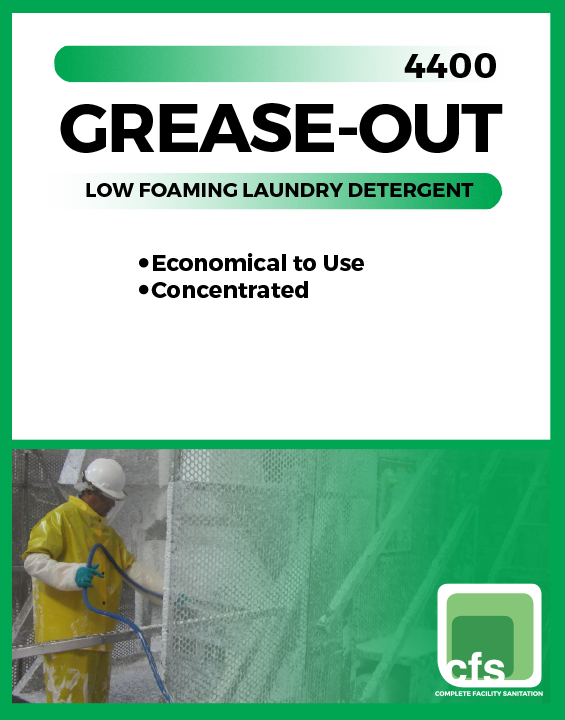 Formulated for use in boil-out, spray and soak operations where organic soils, carbon, heavy burn-on, grease, oil, blood and fat must be removed. 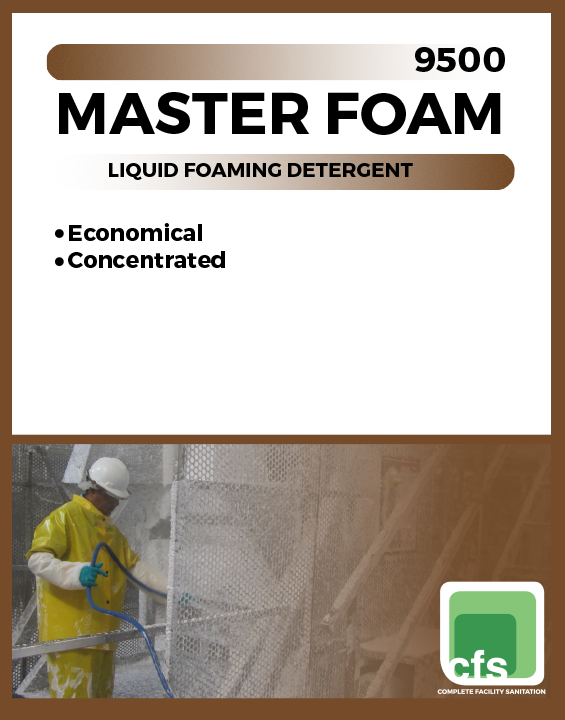 Master Foam is a liquid foam cleaner formulated for the foam cleaning of all types of metals: stainless steel, galvanized, and aluminum. 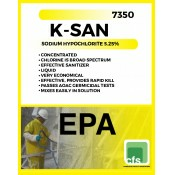 It excels in the removal of protein soils. Master Foam is convenient, economical and ready-to-use. Smokehouse Cleaner Liquid is a concentrated, light brown, heavy-duty alkaline cleaning compound designed to remove burned-on carbons and other baked-on food soils. It is effective in removing oils, greases, and proteinacious deposits commonly found throughout the food industry. 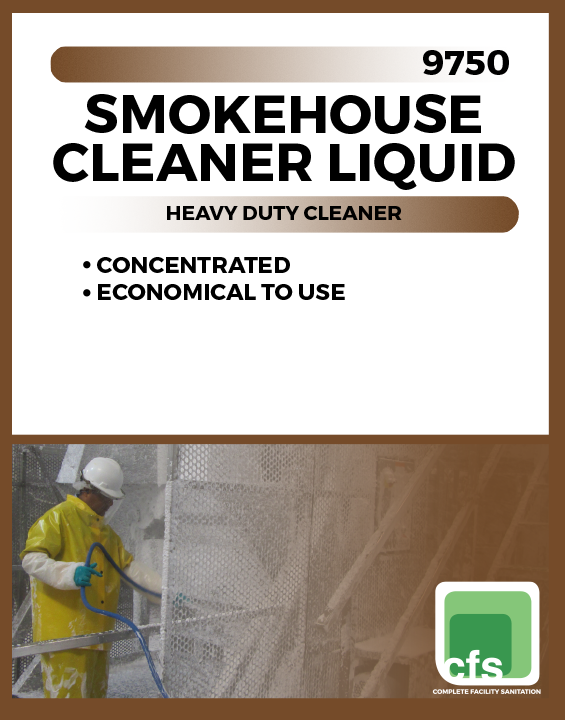 Smokehouse Cleaner Liquid is designed to remove burned-on carbons and other baked-on food soils. 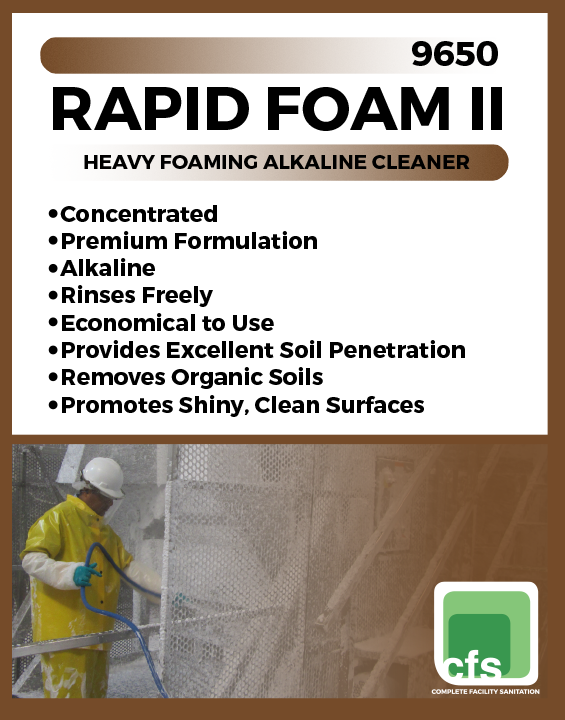 Rapid Foam II is a concentrated, heavy-duty, self-foaming, alkaline liquid detergent formulated for use in all types of food processing plants. 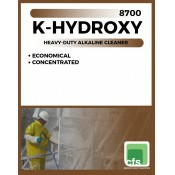 Premium formulation provides superior rinsing in most water conditions. 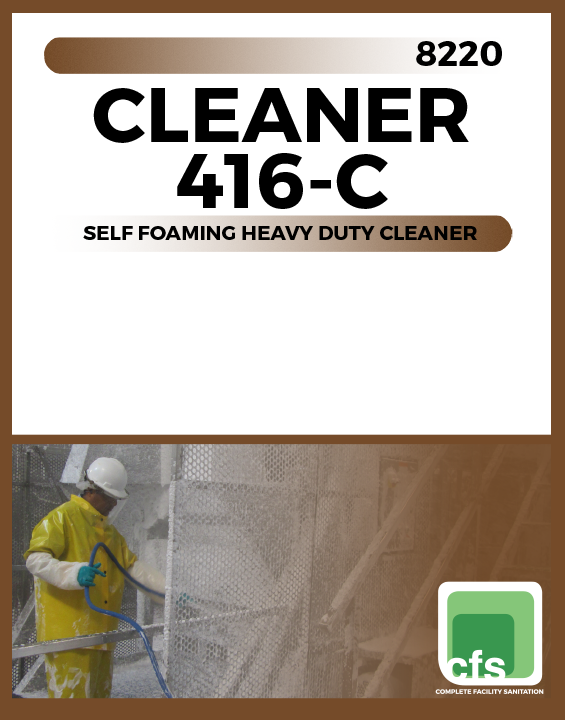 Highly recommended for use in foaming areas that contain heavy grease, oil, fat, blood or carbonized soils. 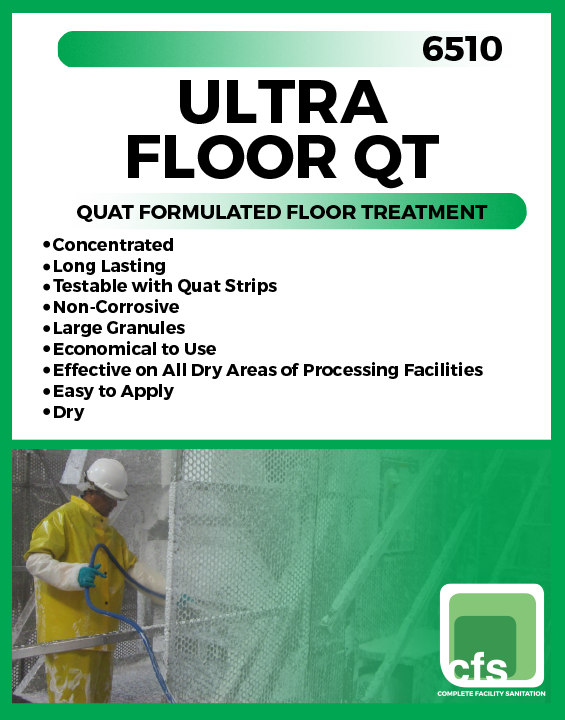 Ultra Floor QT is a powdered quat formulation for extended floor protection. 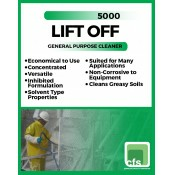 Use after daily sanitation for extended protection of floor areas during production hours. 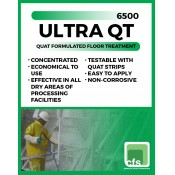 Ultra Floor QT is granulated to aid in slip protection. 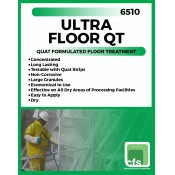 Ultra Floor QT eliminates corrosion damage caused from the use of citric or other acids. 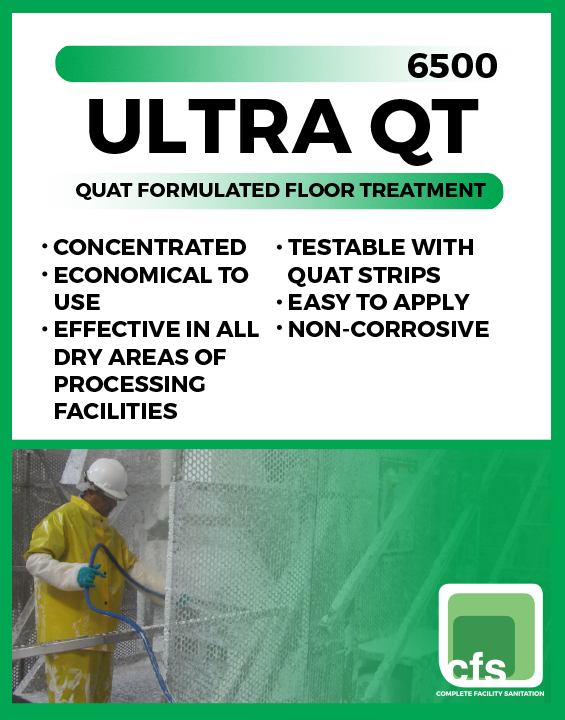 Ultra QT is a powdered quat formulation for extended floor protection. 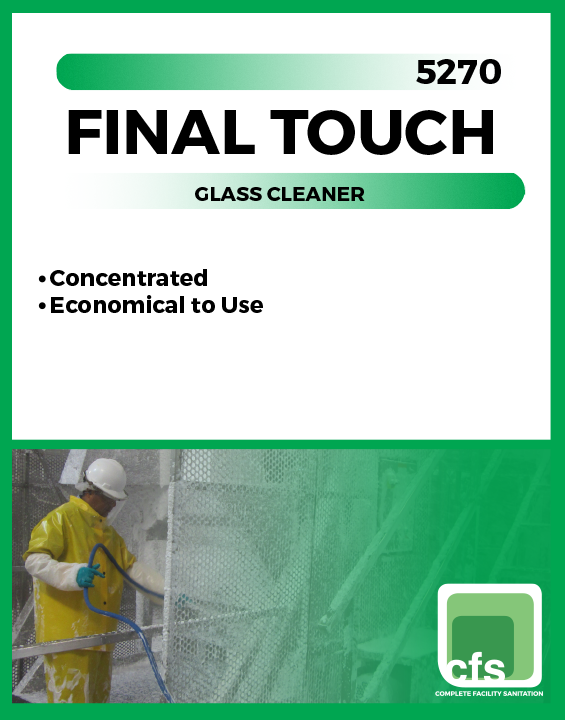 Use after daily sanitation for extended protection of floor areas during production hours. 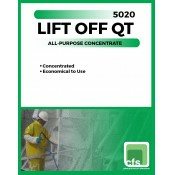 Ultra QT is granulated to aid in slip protection. 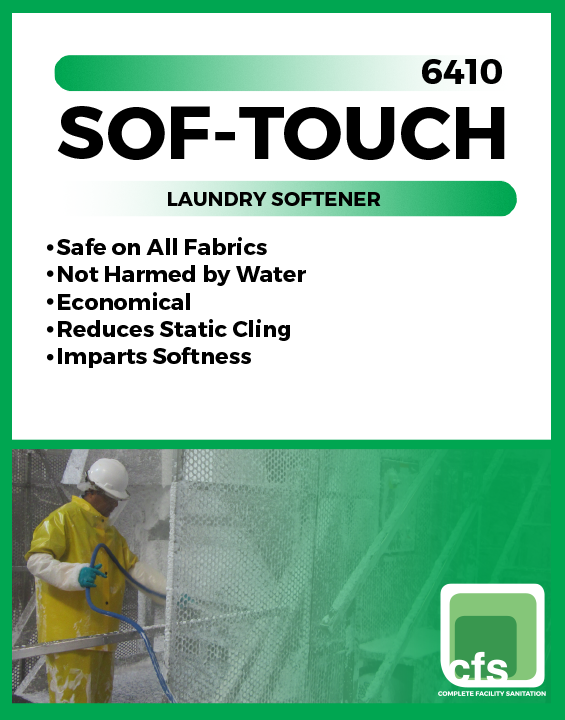 Ultra QT eliminates corrosion damage caused from the use of citric or other acids. 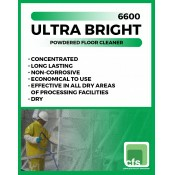 Ultra Bright is a powdered formulation used for extended floor protection. 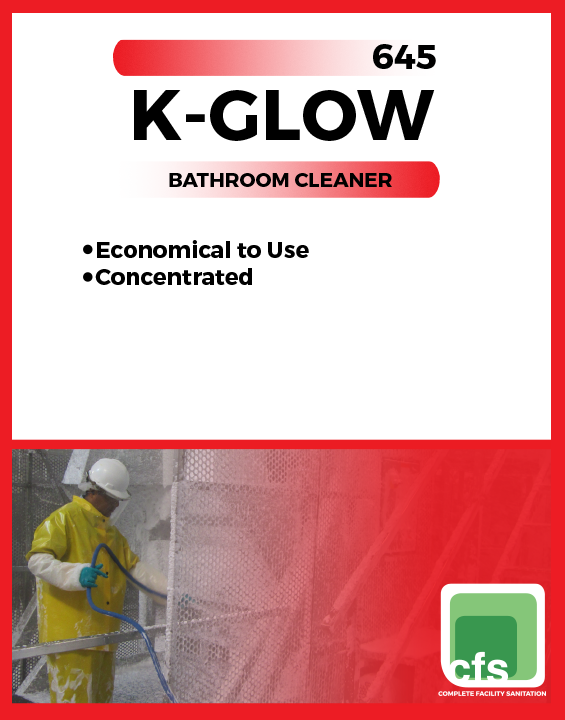 Use after daily sanitation for extended protection of floor areas during production hours. 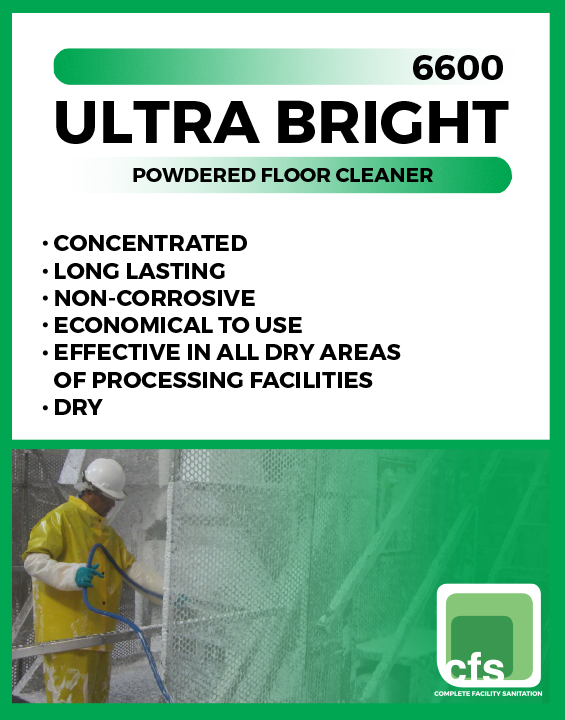 Ultra Bright is granulated to aid in slip protection. 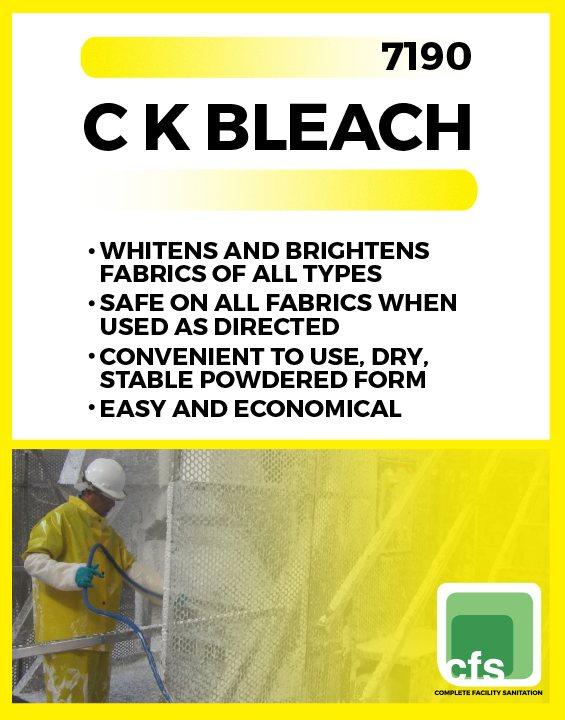 Ultra Bright eliminates corrosion damage caused from the use of citric or other acids. 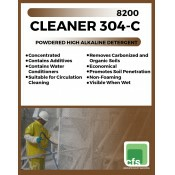 Cleaner 304-C is a heavy-duty cleaner for floor degreasing, steam cleaning and immersion tank operations. 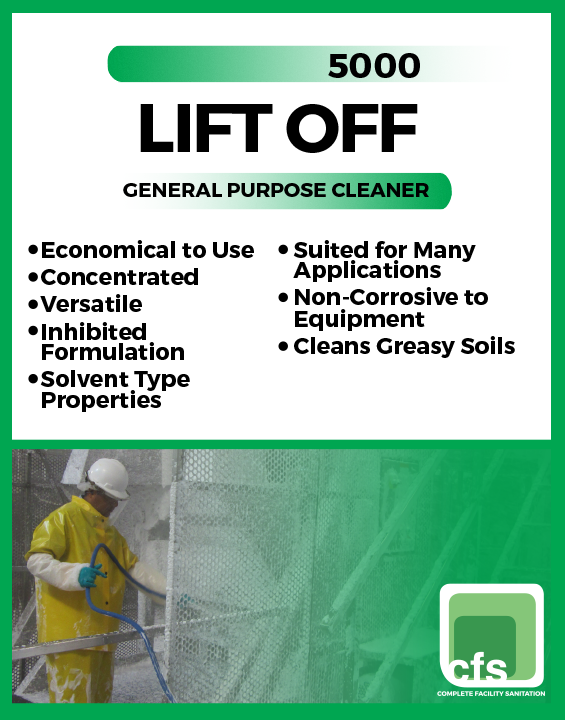 It incorporates a superior blend of biodegradable surfactants and penetration additives that quickly and effectively remove grease and carbonized soil from floors, heavy equipment and machinery. 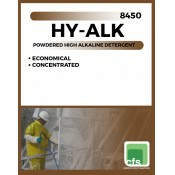 It contains a decreased high caustic percentage compared to other products. 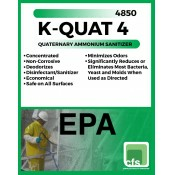 It is also excellent for removal of soils and tars from smokehouses. 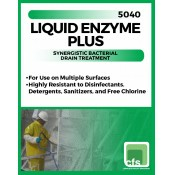 Liquid Enzyme Plus is a drain treatment product consisting of specially developed synergized bacteria which are harmless to human, animal, and marine life. 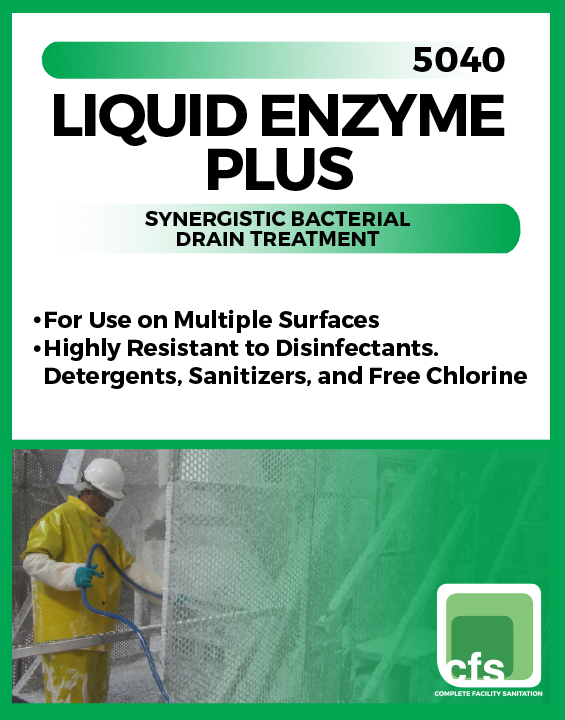 Liquid Enzyme Plus will eliminate foul odors from drains by removing the organic matter causing the problem. It will also eliminate fruit fly problems by destroying their breeding grounds. 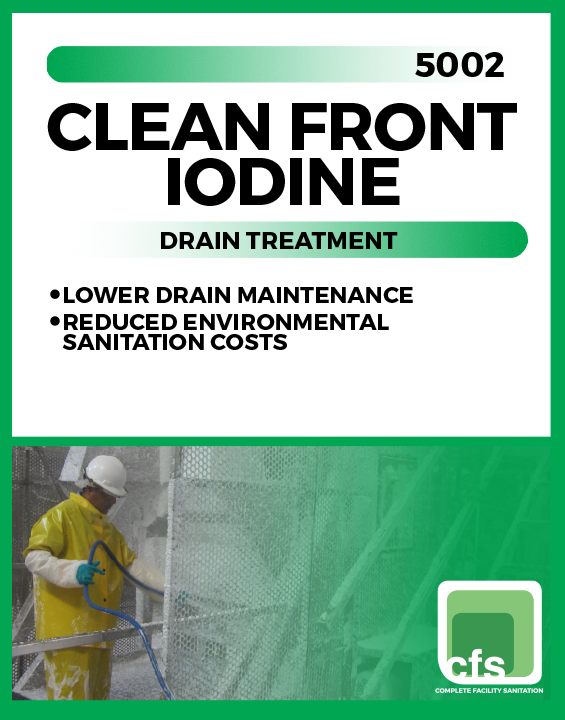 Clean Front Iodine is suitable for use in food plants as an anti-clogging and anti-soil buildup device. 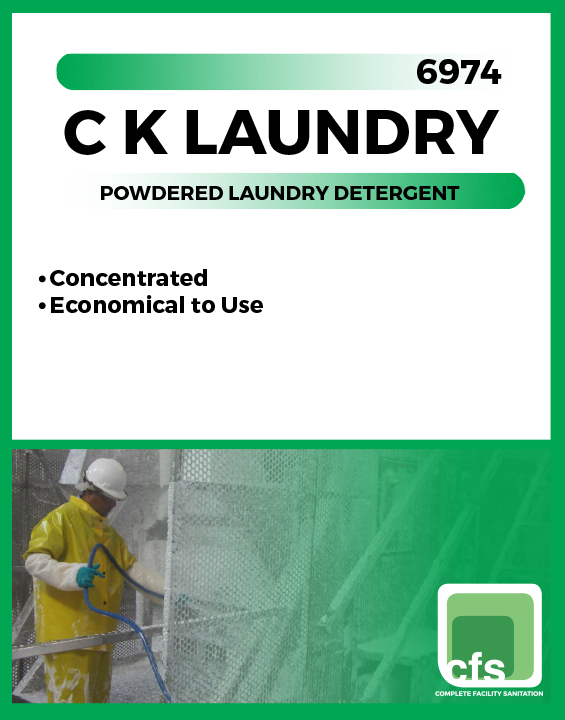 It can also be used to deodorize condensate water and any other standing water in food plants or other facilities. This product is adequate for the control of most odors that occur from condensate and standing water. 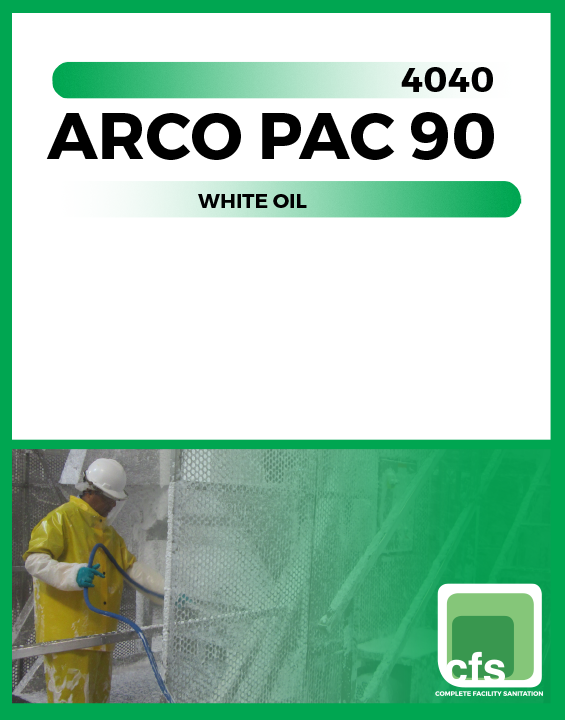 Arco Pac 90 is a relatively odorless, tasteless, crystal clear, technical-grade white oil of the highest quality. It meets and surpasses the requirements of the Food and Drug Administration’s Food Additive Regulation, Section 178.3620b. 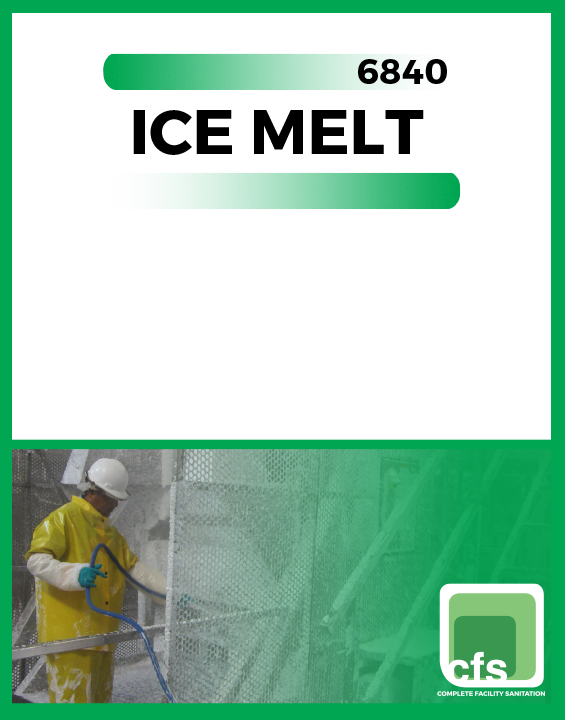 Ice Melt is a calcium chloride mixture that is good up to 20 below. 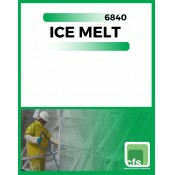 Ice Melt is available in 50 lbs. bags, as well as, 200 and 400 gallon drums. 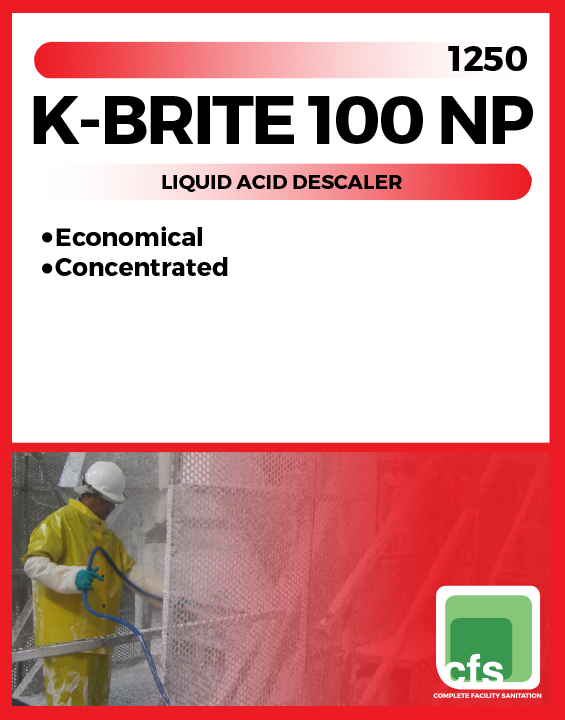 The acid of choice for many pH neutralization applications, due to its high effectiveness and strong acidic nature. 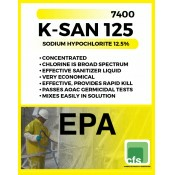 K-San 125 is an economical and effective liquid destainer and sanitizer. 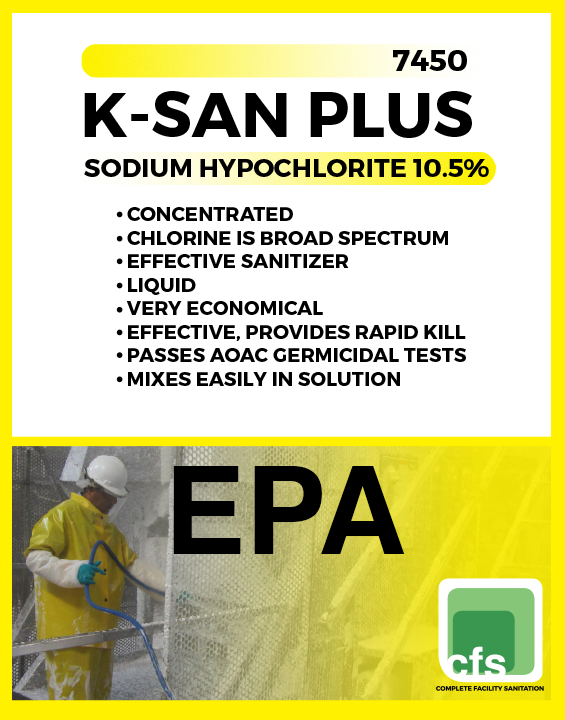 With the highest active levels of hypochlorite in the industry, K-San 125 is a highly dilutable and economical solution for your in-plant laundries. K-Burst 1000 is a 10% active emulsion of polydimethyl soloxane formulated to control foam in industrial processes and products. K-Burst 1000 is a versatile defoamer readily diluted with water or other process liquids for easy addition to foaming solutions and maximum cost effectiveness. 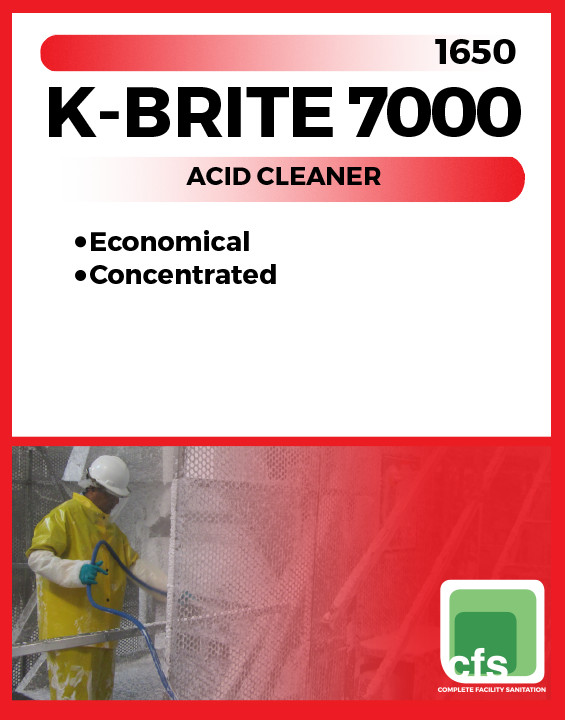 K-Burst 1000 efficiently controls foam over a wide pH range and in nonionic, cationic and anionic systems. 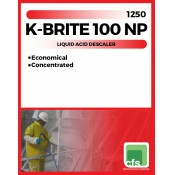 K-Brite 100 NP is an economical liquid acid formulated for use in CIP systems and for manual cleaning. 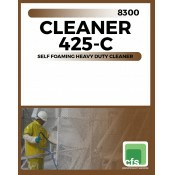 This product can be used in conjunction with our foam additives for foam cleaning equipment. It has excellent film removal properties. 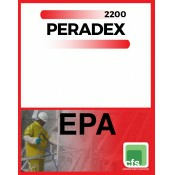 Peradex is used in the dairy, food and beverage processing industry for CIP pipeline cleaning, sanitizing, bottle and filler sanitizing, and disinfection. 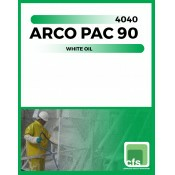 It is also used in the treatment of cooling water, process and wastewater. 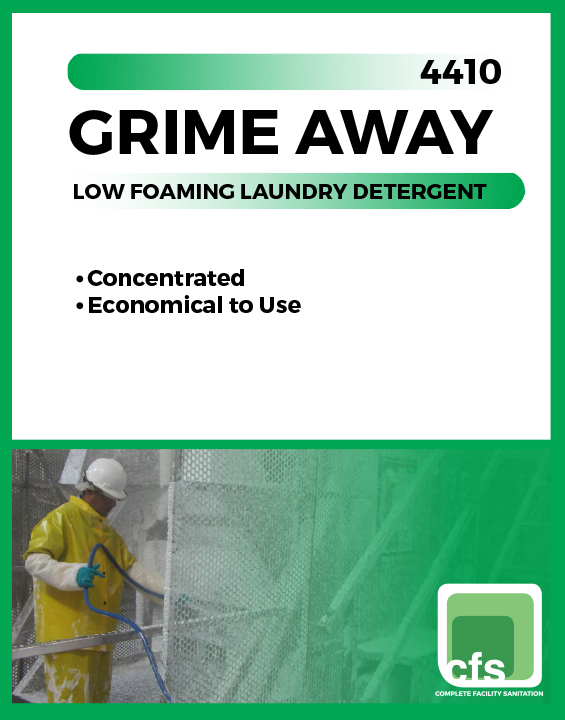 Also, primary uses are for slime and biofouling control, sulfite and odor reduction, and for cleaning UF and RO membranes. 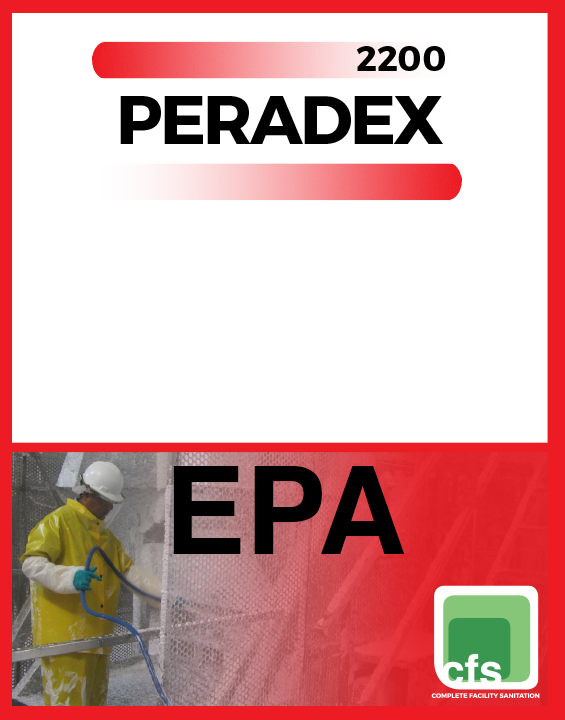 Peroxyacetic acid solutions are also used for disinfection in human and veterinary applications including hospitals. 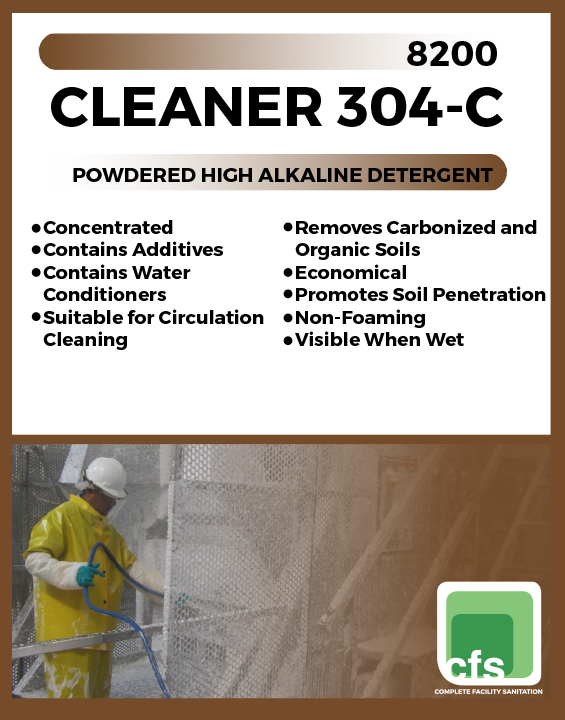 Cleaner 416-C is a heavy-duty alkaline cleaner designed to remove burned-on carbon and other baked-on food soils. 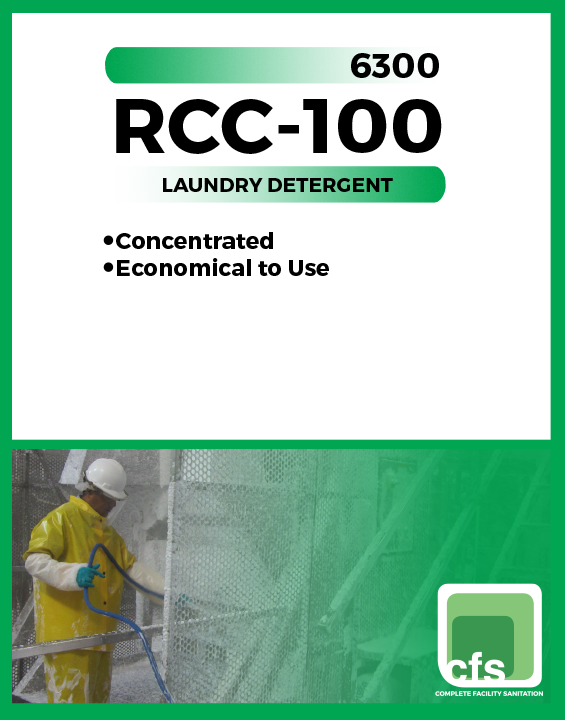 It is effective in removing oils, greased, and proteinaceous deposits commonly found throughout the food industry. 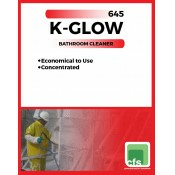 It can be used in central cleaning systems, soaking operations, and immersion tanks. It can be used for boilout with foam and gel, and in recirculating systems of breweries, dairies, bakeries, meat, poultry, canning, and other food plants. 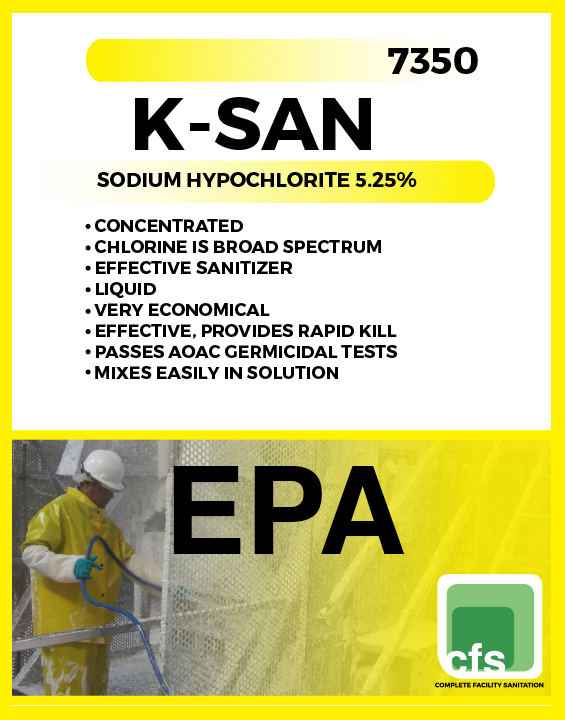 K-San Plus is an EPA registered, refined, liquid chlorine sanitizer and deodorizer used to sanitize all types of dairy, food and beverage equipment. K-San Plus contains 10.5% sodium hypochlorite. 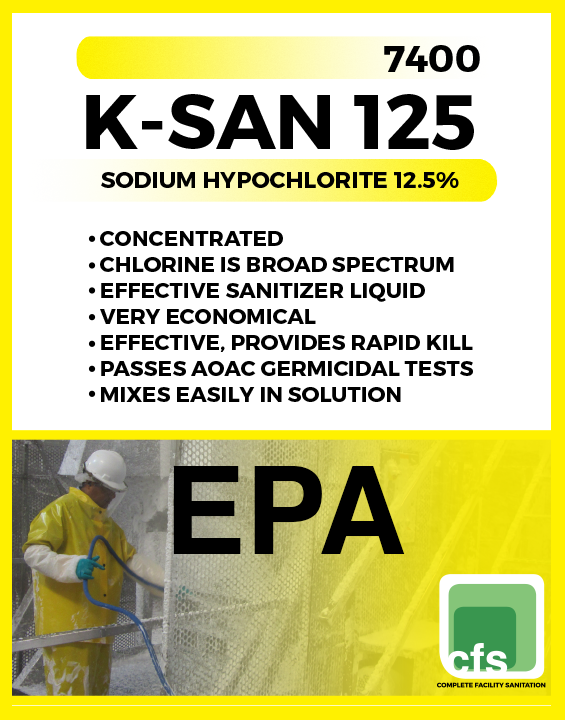 K-Foam 121 is a premium liquid all-purpose cleaner containing a blend of alkaline salts, neutral solvents and hard water sequestrants. 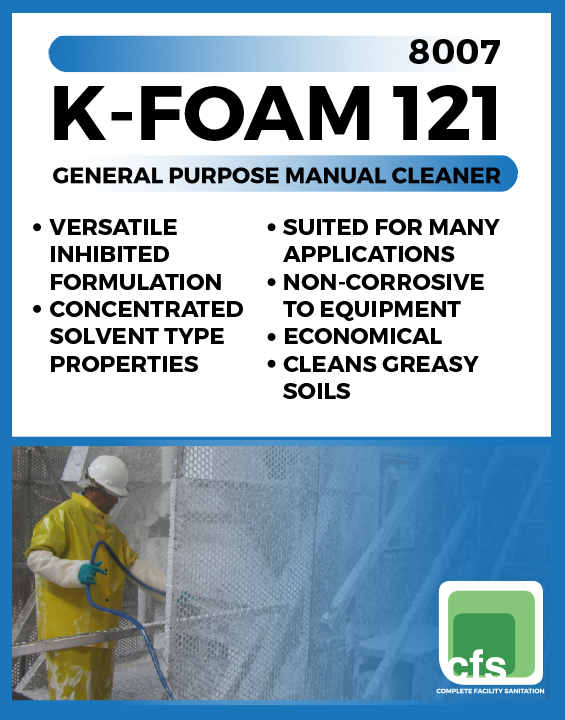 K-foam 121 contains wetting and penetrating agents, anti-redeposition agents and rinse agents to remove organic and greasy soils, yet it is mild enough for manual cleaning applications. 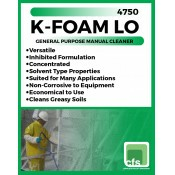 K-Foam Lo is a medium-duty, multipurpose alkaline cleaner and emulsifier that provides excellent penetration of fats, oils and numerous other soils. 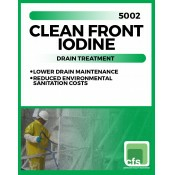 Soil removal is rapid and rinsing results in a film-free surface. 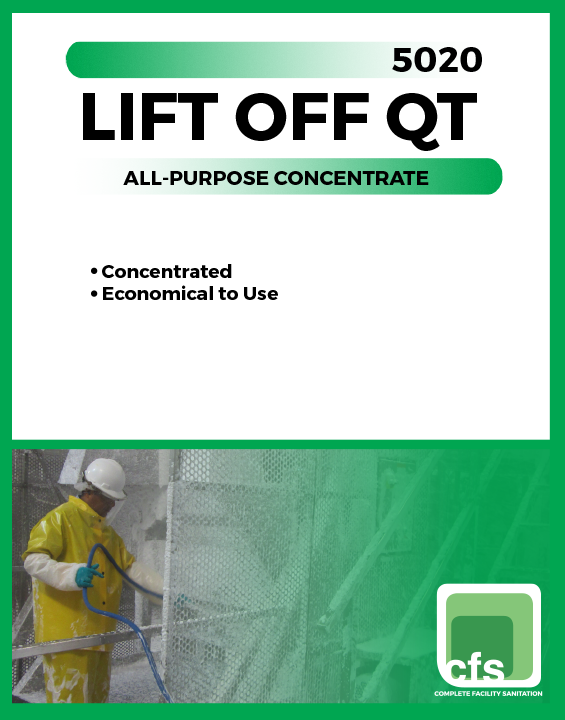 Lift Off QT is a medium-duty, multi-purpose quat based cleaner that provides excellent penetration of numerous soils. Soil removal is rapid and rinsing results in a film-free surface. 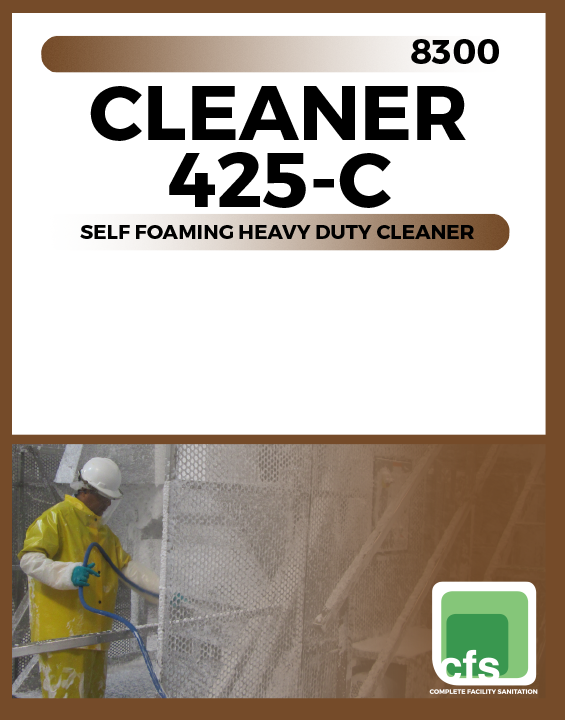 Cleaner 425-C is a heavy duty cleaner with built-in foam additive for use in the food and beverage industries. 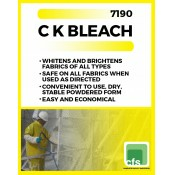 It is ideal for use on heavy encrusted soils and rinses off readily. 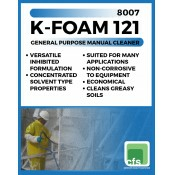 Extra thick foam is obtained when used with any suitable foaming device. 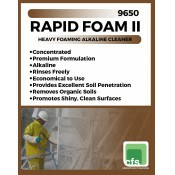 This provides maximum dwell time of the cleaner to penetrate the soil and effect removal. 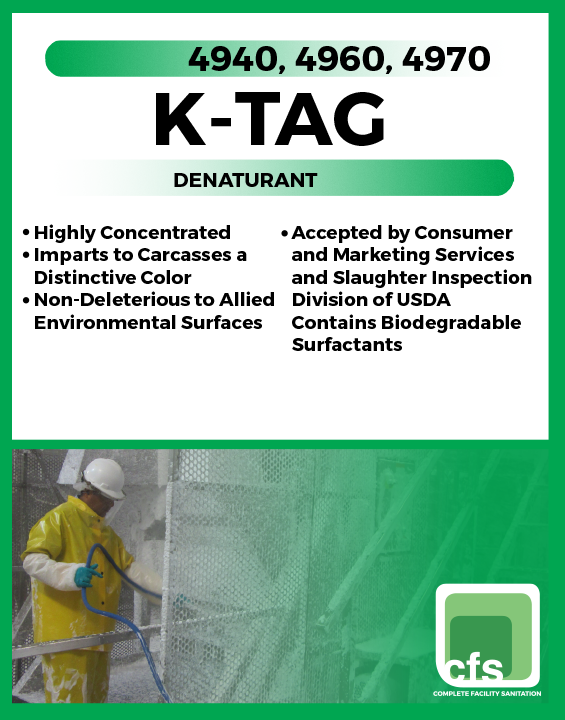 K-Tag is a concentrated, liquid denaturing agent for use on condemned products in meat, poultry and rabbit processing plants. 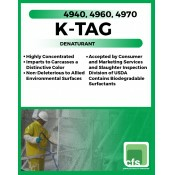 Spraying of the condemned products with a solution of K-Tag imparts to the product a designated color. Available in Blue, Green or Red.